Dawsonera have informed the ebooks team that Pearson have altered their digital rights on all of their ebooks. As a result, from today, January 12th 2015, Pearson content is no longer available to download, and our users can only access their content online. This change includes Pearson titles that the library has already purchased as well as all future purchases of Pearson ebook titles from Dawsonera. Please note that users can still access Pearson content via the read online functionality and users can still print and copy within the read online mode. There are currently 83 Pearson published Dawsonera ebooks in the universities’ ebooks collection. 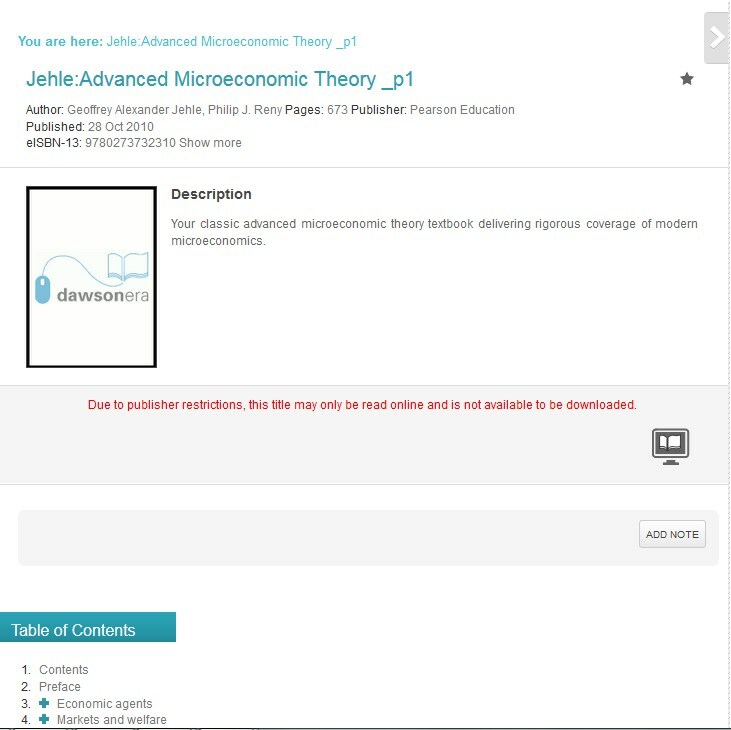 Please see below for what users will now see when accessing Pearson ebooks on Dawsonera. The inability to download should be clearly indicated in red and the downloading icon is absent. The ebooks@cambridge Advisory Group have clearly expressed their concerns about this retrograde step to Dawsonera and this in turn will be fed back to Pearson by the suppliers. Please send any comments to the ebooks team on ebooks@lib.cam.ac.uk. This entry was posted in Service update and tagged dawsonera, downloading, Pearson by evaluna71. Bookmark the permalink. Libraries must stop wasting resources purchasing Pearson titles till this counterproductive decision is reversed. It contradicts the very idea of libraries lending reading material to patrons. This unfortunately affects one chemistry title, Housecroft’s ‘Inorganic chemistry’ (4th ed. ).